Read the Goodreads synopsis here. It’s been a long time since I’ve read Amy Tan. But, reading this book has reminded me why her books are so loved. I thoroughly enjoyed immersing myself in this story. 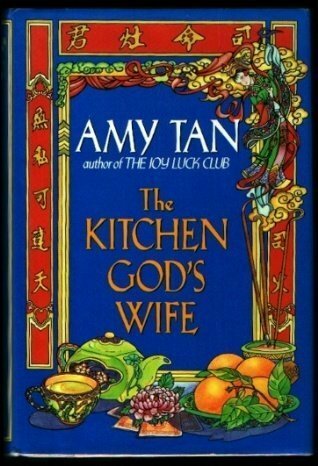 Amy Tan’s characters feel so real that you can’t help but like them. And, I found her writing style intimate and engaging with the details of Winnie’s personality shining through in her every word. In The Kitchen God’s Wife, Winnie tells her daughter about a whole life she had before she came to America – a whole life her daughter didn’t know about. As Pearl listens to her mother’s story, she finds out who her mother really is. As with most historical fiction, the best part about this book for me was learning about the past; in this case China’s past, leading up to WWII and beyond. Included in the history is a fascinating look at what women’s roles were in China at the time, and how they were expected to behave as daughters and as wives. In this book, Winnie has two very different experiences of being a wife. The first is with her husband in China, starting before the war and ending right after it. The second is the marriage she has with a Chinese American who she meets in China during the war. This second man treats her very differently than the first. In 1930s and 40s China, girls and women were taught how to be good wives. This, in itself, is an indication of what it means to be a wife in China at the time. Being yourself is not enough – you have to be taught how to please your husband; like it is a skill that you can either succeed or fail at. “Learning” how to be a good wife would surely be confusing to a young girl who has not had anyone to model what a good marriage looks like, let alone what love or respect looks like. So this is what my mother-in-law taught me: To protect my husband so he would protect me. To fear him and think this was respect. To make him a proper hot soup, which was ready to serve only when I had scalded my little finger testing it. And I believed she was also saying that this kind of pain for a husband was true love, the kind that grew between husband and wife. I had also learned this in the movies, both Chinese and American. A woman always had to feel pain, suffer and cry, before she could feel love. And now that I was living with Wen Fu in a little monastery room in Hangchow, I suffered a lot. I thought my love was growing bigger and bigger. I thought I was becoming a better wife. It was many years before Winnie was brave enough to think about getting out of her marriage to Wen Fu; to even believe that she deserved better. She was beaten down by him, and terrified. But worse was the thought of staying. I tried to keep my mouth close so our house would stay peaceful. But inside I would be fighting myself, no peace there. Her second husband was kind to her, didn’t expect any more from her than she was willing to give. In this way, she was finally able to experience mutual respect and love, instead of fear and hate. This is also the kind of life she was desperate to pass down to her own children, so much so that she had not been planning to tell the story of her past at all. Why did stories always describe women that way, making us believe we had to be that way too? 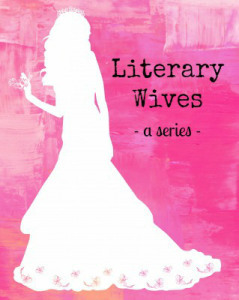 Our next Literary Wives pick is A Circle of Wives by Alice La Plante, to be discussed on February 1, 2016. Feel free to read along and join in the discussion! I love “wives” books! I have a whole shelf on Goodreads I call “famous wives.” Some of my favorites have been American Wife by Curtis Sittenfeld and The Paris Wife by Paula McLain. Though “wife” isn’t in the title, I also loved Mrs. Hemingway, Mrs. Lincoln, Twain’s End, and Z: A Novel of Zelda Fitzgerald. Thanks for the suggestion, Rebecca! Most of these we haven’t read yet. Right now we are still working on books with ‘wife’ in the title, but we may branch out into other books about wives (as long as we can get some good suggestions, like these ones!). This is such an interesting idea. Have you read The Wives of Los Alamos? That would make a great discusssion. We haven’t read that one together yet, but I think a couple of us have read it individually (not me). I’m hoping it will eventually make it onto our list! I love the idea of this book club – there are so many books that fit this category! Have you read The Wife by Meg Wolitzer yet? Fantastic and perfect for this! I love the quotes you shared and need to try Amy Tan (I’m kind of embarrassed to say I haven’t gotten to her yet). I liked what you had to say about the stories. 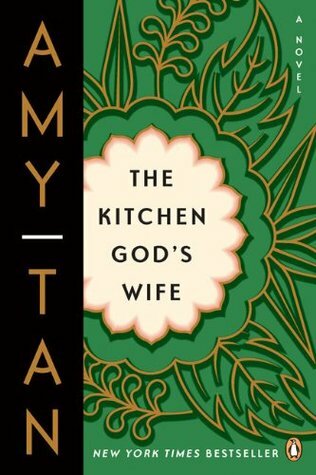 Of course, the story of the Kitchen God’s wife is a perfect example of that quote. I remember feeling the same way about some of the fairy tales we used to read when I was a child, particularly one called Patient Grizelda. The story was about a prince who fell in love with Patient Grizelda but wanted to test her to see if she was worthy of him. So, he puts her through all these terrible trials and she remains patient and finally gets to marry him. Even as a youngish girl (before preteen), I was incensed by this story and wondered what the prince thought was so great about him that he thought he could test Grizelda. I also thought if I was Grizelda, I would never marry him. It sounds like fun, but it also doesn’t sound like my thing. Still, nice message. I was in my 20s when I discovered the Paperbag Princess, but I thought it was just wonderful then, and I still love it now. I’ve just read Neil Gaiman’s The Sleeper and the Spindle and it has left me with the same feeling: a retelling that just feels so “right”. 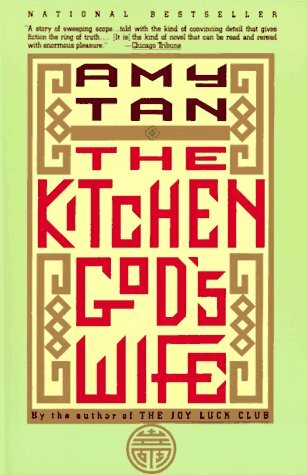 TheKG’sWife is the Tan novel I always think of as my favourite, but I think I should reread and see if that’s still true. Also, I’ve lost track of the last couple of books she’s written, so there might be a new favourite waiting. If you’re interested in books about writing, her Opposite of Fate is good too. The only other one I’ve read is The Joy Luck Club. It was a while ago, so I don’t remember a lot, but I do think I liked this one better. I think you’re right. In fact, as I was thinking about it for my review I was wondering if things really are that much better than in the past. In some ways, it is, but in terms of the messages we receive from so many places, it almost seems worse.I like to believe, though, that the positive messages our children are getting at home will help them ignore some of the others (but I can’t speak for all children and all homes). I think one of the troubles I had with engaging with this book this time around was the use of passive voice. Did anybody else notice how often the writing was constructed this way? Hmm, I usually notice things like that, but this time I didn’t. Was it in the dialogue or the description? If it was in the dialogue, then maybe she is trying to construct a particular character’s way of expressing herself, but if it is in the description, then it’s just not the best writing. Oh this is the one you were recommending! It does sound like something I would like. Especially the exploration of the idea of what a perfect woman is supposed to be. I think you would like it! It felt hard to get into at the very beginning, but once Winnie starts telling her story, you’ll be hooked. Oh, I had forgotten about that. But, you’re right – that was a good reason for Winnie not to talk about any of it. Not until she knew he was out of the picture. There wasn’t much to say about her second marriage really, except that it was much better. It’s too bad it ended so soon. I tried to reply to your question on Lynn’s page, Naomi, but it wasn’t taking my comments. My thought was that thinking of the past was probably painful for Winnie and embarrassing, so maybe she didn’t want to think about it. And there are also many people who think the past should stay in the past. I think that’s unfortunate and that people should convey their history forward to the next generations. I am just now discovering things about my family that I would like to ask my parents about. Unfortunately, they have been dead a long time, so I can’t ask them. That makes sense. I was also (since) thinking that when we are young we don’t always care about our parents’ past, or even think that they have one. So, you kind of have to wait until your kids get past that stage. Yes, that’s true, although I think we might care more about their past if they told us anything. I remember being interested in my grandmother’s past at a fairly young age (like maybe around 10 or 11) and trying to get her to talk about it, but she didn’t tell me very much. Huh. The chicken or the egg. I agree that it might be a function of aging into adulthood, but for me, I think it was also a matter of getting beyond that stage of “raising children” that took literally 100%+ of my time! Though my grandmother shared a lot with me while I was young and it was easy since my mother and I lived with her. But my mother didn’t. And actually, I’ve discovered so many ways in which she actually lied to me about things that are very important to me. So for me it was better to discover the truth after she was dead. I read the book, but found it to be too melodramatic and very racist against Asian men. That’s interesting to hear. I wish it was still fresh in my mind – everything’s a bit fuzzy now!